In August 2005, I became a Financial Accounting Manager within a large, globally listed company. I was in my late 20’s just starting off my corporate career. Over my tenure with the company, my leadership lessons were based on a system of a ‘carrot and stick approach’, a system that is commonly used in many companies. Fast-forward 8 years – I am now a business owner and the Club President of a newly chartered club. I quickly learnt that I needed a totally different style of leadership to lead a team of volunteers. So began my journey to learn how to lead by SERVING first. I needed to be a catalyst for the club. I recall at the committee induction – I was asked to publicly declare my Distinguished Club Points vision for the club. Very innocently – I replied, “President’s Distinguished Club (PDC) of course!” I went home that night and I could not sleep – I felt like a Director of a company – I had recklessly declared to its shareholders what the expected year-end share price would be – without having a realistic plan in place! However, I did realise that the public declaration was the catalyst towards achieving the big dream. I started to challenge my defined comfort zones by progressing with my own educational awards. I completed my Competent Communicator award within 6 months, my Competent Leader Award, 2 months later, closely followed by my Advanced Leader Bronze Award and my Advanced Communicator Bronze Award. I also had an opportunity to mentor a new club within 12 months of joining. Fellow club members then became inspired themselves to achieve their own educational goals. I was proof that it was possible to achieve goals within a short time period. If I could do it – they could too! I couldn’t lead the club to PDC on my own. I then learnt how to be highly persuasive as a leader by focusing on the needs, values and reasons for a member to have joined a club. I learnt how to listen with intent and to use the information they provided to me to help the club member align their educational goals, to their purpose for joining and to align their purpose to the club’s goal. With this skill I helped the club to become a PDC for 2 successive years since it chartered. This is a big feat for a newly established club! Lesson No 4: Give people a chance to speak. During corporate meetings, I got used to being interrupted myself during my own presentations. At the toastmasters club, I learnt that every club member, regardless of their role, is given an uninterrupted platform to speak. It was a refreshing change! I learnt to listen to others and I also appreciated the value of providing an uninterrupted listening platform for other members. In my second year as a Toastmaster, I was Area Governor looking after 5 clubs, Immediate Past President – in this capacity I am mentoring the new Club President that took over from me, and Vice President of Membership for a 2nd club that I joined. These were 3 big roles that I took on – all voluntary – all being served in a period of the same 12 months. As daunting as these roles were, I learnt that being in these positions gave me immediate access to a bigger Toastmasters community. I learnt how to connect club members in my area with club members within the other areas. I learnt to ask for help. In my corporate experience, I often found that asking for help was seen as a sign of weakness and so I became hesitant to ask for help. Within Toastmasters, I learnt to say, “I need help please, who do you know can help me with…” I did this quickly and I did this often, and the help came from all directions! Lesson No 6: Set high standards and create a succession plan for future leaders. In my role as Club President and Area Governor, I worked hard with teams all around me to create events of a high standard. Regardless if it was a speech contest or a club meeting or an evaluation training, by setting high standards, it allowed fellow club members to execute high quality beyond their initial expectations. Encouraging fellow members to participate in such events also made succession planning much more simpler. Lesson No 7: Challenge the norms and celebrate success. When I joined as a Toastmaster, I was told that most people achieve Distinguished Toastmaster within 5-10 years. With advance planning and mentors by my side, I was able to become a Distinguished Toastmaster within 2.5 years. I learnt to celebrate success often, do it immediately and celebrate publicly. The leadership skills that I learnt in Toastmasters have inspired me to develop my own system of leadership that I teach today. I practice Servant Leadership and coach my delegates and clients on how to become collaborative and customer-centric too. 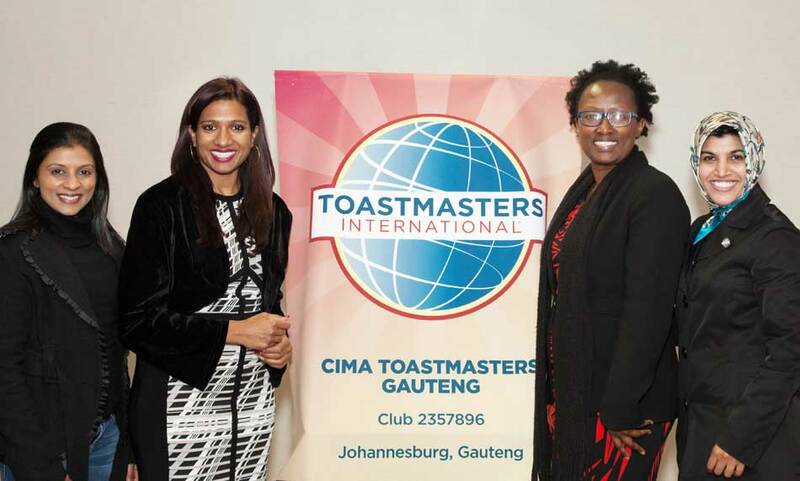 Dineshrie Pillay DTM is a member of CIMA Toastmasters Gauteng. Dineshrie Pillay is the founder of Neospectives Consulting, a business leadership training firm. She is an executive coach and leadership development consultant.